Together with the Norwegian shipyard Fjellstrand, Siemens has developed the world's first electrically powered car ferry. The 80-meter vessel can carry 120 cars and 360 passengers. From 2015 onward, it will serve the route between Lavik and Oppedal, across the Sognefjord. The ship's batteries will be recharged in the breaks between crossings, a procedure which only takes 10 minutes. These serve to recharge the ferry's battery during turnaround and are then themselves slowly recharged from the local grid. Hundreds of ferries link Norway's mainland to the islands off its coast and provide routes across its many fjords. 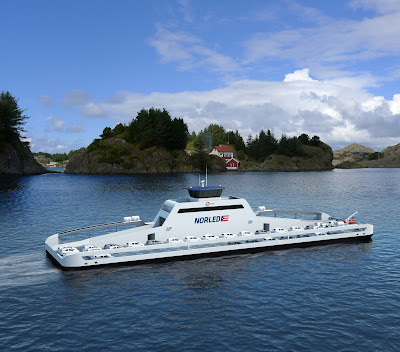 Using today's battery and recharging technology, all crossings of up to 30 minutes in duration could be served by electrically powered vessels.